Speaking of Research try to keep on top of the latest statistics coming from governments around the world. This post will look at three countries which have recently published their 2015 statistics. The Czech Republic reported a 1% rise in the number of animal procedures to 234,366. This was mainly fish (38.5%), mice (31.5%), rats (13.1%) and birds (11.1%), with all remaining species collectively accounting for only about 6% of procedures in 2015. Dogs, cats and primates together accounted for less than 0.5% of research procedures (980). There was a marked rise in the use of fish (+20%), rats (+11%) and livestock (+45%), with decreases in mice (-9%) and reptiles/amphibians (-73%). Mice, rats, fish and birds accounted together for over 95% of procedures – similar to many other European countries. The most common areas of research were “basic research” (39.7%), “protection of the natural environment in the interests of the health or welfare of humans beings or animals” (27.0%) and “Translational and applied research” (8.9%). There has been less animal research in the 2013-15 period than at almost any other time since 2000, though it is unclear from the statistics why this is. 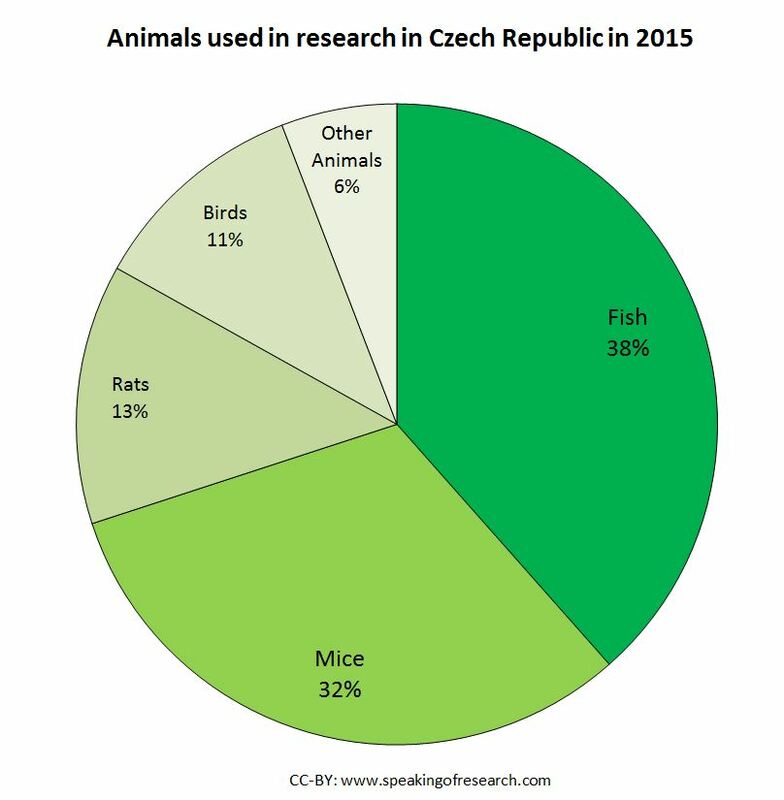 Trend over time in animal experiments in the Czech Republic. Click to Enlarge. The small Eastern European country of Estonia also provided its 2015 statistics recently, showing a 33% drop, from 6,164 procedures in 2014, to 4162 in 2015. A number of species used in 2014 were not used in 2015. Procedures on cats fell from 126 to 0, and pigs and sheep (previously 10 procedures) also ceased. 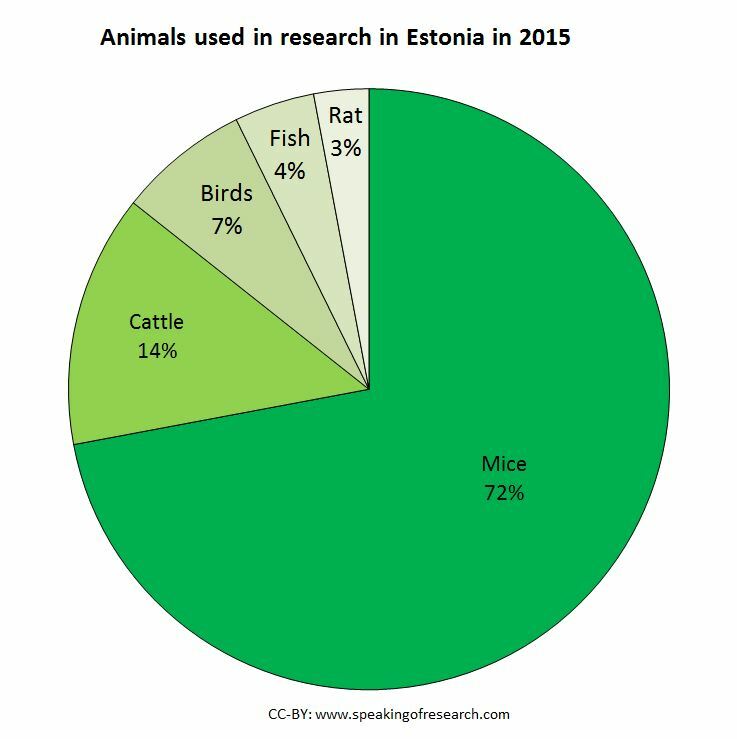 As is typical in many European countries, rodents, fish and birds accounted for most animal research in Estonia. Most procedures were mild or moderate, with only 8% of procedures (mostly on mice, with 23 on rats) being classified as severe. You can see examples of how procedures might be classified on the example list produced by the EU. Another small European country, Slovenia reported that it conducted 9,110 procedures in 2015, down 21% from 2014. The main change was the fall in mice by 22%. Mice still account for 94.6% of all animals used in research in Slovenia. Amphibians had not been used in studies in 2014, though the 95 animals may all have been from a single study. As is the case in many smaller countries (but not all), most of the research was animal testing for regulatory purposes (74%), followed by translational and applied research (12.9%) and basic research (10.6%). Posted on November 3, 2016 May 5, 2017 by EditorPosted in News, StatisticsTagged animal stats, czech republic, Estonia, Slovenia, Statistics, stats.